As in ballroom dancing, a general rule for screenwriting is that someone has to take the lead–there must be a protagonist. But what if a story is a dance that involves three equal participants? Perhaps the most notable aspect of The Favourite, the latest film from director Yorgos Lanthimos, is the way in which the viewer’s sympathies are never aligned with a single character. The result is a film in which the shifts in allegiances and motivations can be dramatized on a scene-by-scene basis, creating a story that is not only brutally funny but also wise and ultimately poignant. Broken up into chapters that underline the film’s dryly detached tone, the film is set in early 18th century England. 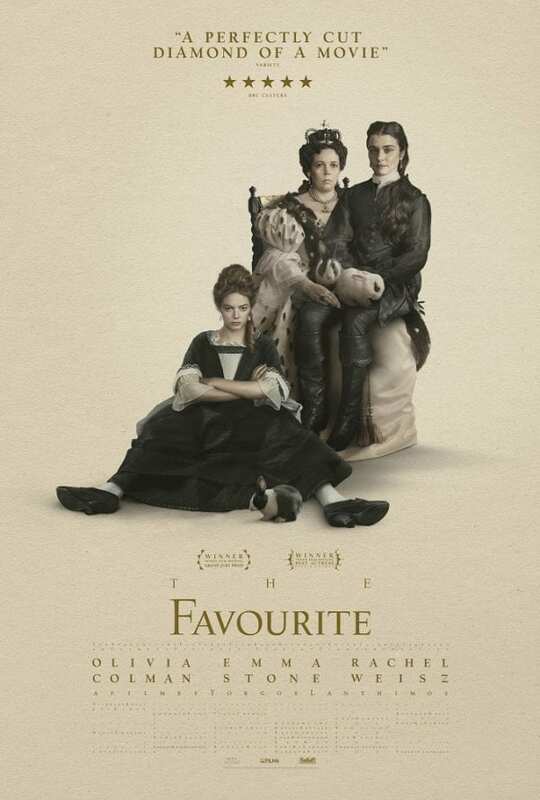 Vexed by a seemingly endless war with France, a populace that is on the verge of unrest from taxation, and a parliament full of vipers and nincompoops, the gout-plagued Queen Anne (Olivia Colman) finds her only solace from Sarah Churchill, the Duchess of Marlborough (Rachel Weisz). Friends since they were girls, Sarah provides the mercurial and indecisive queen with both political counsel and physical affection, giving her a power in the court that vexes her rivals in parliament, particularly the scheming leader of the minority Robert Harley (Nicholas Hoult). Arriving into this delicately contained madness is Abigail Hill (Emma Stone), the poor cousin of Sarah who quickly makes her way from the maid’s quarters to the Queen’s chambers with equal parts industriousness and duplicity. Although cautious of a potential rival, Sarah initially sees Abigail as both a protégé and a helpful distraction, allowing her to take leave of the Queen to attend to important matters of state. But soon Abigail begins to supplant Sarah in the Queen’s affection, and after a marriage to courtier Samuel Masham (Joe Alwyn) gives her the title of Baroness, there doesn’t seem to be anything standing in the way of Abigail’s quest to take a permanent place at the Queen’s side. Based on his previous films, costume drama would not seem to be the next step in Lanthimos’ already impressive filmography. This film is also the first time he is working from a script written by others. And while this is a strikingly directed film (with a particularly memorable final shot), what is most impressive here is the evenhanded approach to the story that Lanthimos employs. It would be easy to shape this material as the story of the scheming up-and-comer, or of the intelligent but outwitted veteran, or of the monarch with a failing body, delicate heart, and ruthless sense of her god-given authority. But instead of placing emphasis on any one of these three lead characters, the script instead looks at the relationships between them, the shifts in allegiance, and ultimately the tragedy that comes when people are trapped in a set of rules that favors power over truth. The mordant humor of The Lobster can be found here, as can the fatalism of The Killing of a Sacred Deer, but this film represents a major step forward for Lanthimos in his direction of actors. Surprising for a film with all the corsets and high-laced boots one would expect for the genre, but the cast here is allowed to have much unexpected fun with the material, with Colman being the standout for both the complexity of her role and the surprising directness of her dialogue (with one line that will unfortunately have to be censored for any of her inevitable award montages). But Weisz and Stone are equally impressive, conveying not just the intelligence behind their chess moves but also an understanding of the implications of their actions. Meanwhile, the men in the film (almost exclusively adorned in wigs) are appropriately sidelined, although still filmed in a way that stresses their societal power. For all of Lanthimos’ technical flourishes, it is the screenplay that is the standout here, with a trajectory that might not be unexpected in where it ends up but in what it reveals about its characters. The explicitness of the sexual relations between the women will probably be the story’s most discussed element, but the biggest surprise here is the reveal that underneath all of the deception and artifice are real emotions. But just as favor can flip on a dime, so can love turn to hate, and influence to entrapment.